In order to keep feeding the debates on how to put citizen participation at the service of social inclusion, the Committee has edited and printed the study "Social Inclusion and Participatory Democracy: From the conceptual discussion to local action", carried out in collaboration with the Institute of Government and Public Policies (IGOP) of the Autonomous University of Barcelona. 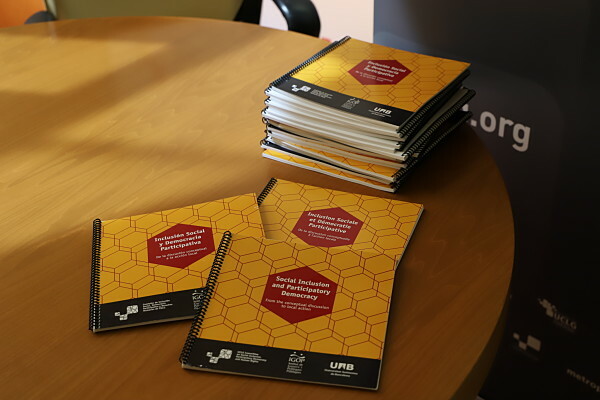 Inspired by local policies presented in the Committee’s Inclusive Cities Observatory, the added value of the study lies in its capacity to inspire a renewed approach on municipal policies of participatory democracy and social inclusion. Strongly influenced by the consequences of the global economic crisis (2007), the starting point of the study lies in a denounce of the alleged main cause of the same crisis: a "globalization expressed almost exclusively through the market". It therefore notes how global capitalism is capable of generating both "extraordinary opportunities for certain elites and regions of the world to become wealthier" as well as "economic dislocation, job insecurity, inequality and social fragmentation". The study focuses then on the economic crisis wider effects on governance, recalling how although the crisis “hasn’t changed the basic features of the system”, it has indeed “limited the capacity of governments on all levels to tackle economic and social problems through their own policies”. In response to the impacts of the crisis and globalization itself, worldwide municipalities - as the level of governance closest to the citizens and the territory, where the effects of the crisis are particularly felt – as well as their people can gather and ally themselves around the notion of the Right to the city: to fulfil urban territories as co-created spaces at the service of the common good, in opposition to the growing commodification of public life and the increase of competitiveness between large metropolitan areas. According to the publication, although local governments are far from being "leading political players" in a globalized world, cities are nonetheless "the main battlefield in the fight for democracy, participation and inclusion" and local governments have "more leeway to maneuver to develop their own strategies and policies than they did just 30 or 40 years ago". How to link local policies on social inclusion and participatory democracy? Taking into consideration all the strategies and policies that local governments have in their hands to tackle inequalities and promote fairer cities, social inclusion and participatory democracy are soon identified as promising starting points. Studying and linking both of them will therefore constitute the guiding thread of the study. Throughout its first three chapters, both the concept of inclusion and that of participation are studied (respectively) as a “as a regulatory ideal and political project in 21st-century urban societies” and “a spearhead for inclusion in the democratic system”. On the basis of these assumptions, the study makes an assessment of the various dimensions of social inclusion (as occupation, recognition, bonding…) as well as a critical analysis of the contradictions and weaknesses in the so-called “discourse of inclusion”. A special emphasis is devoted to what the text calls "excluding and exclusion producing democracies": a rooted phenomenon leading to "explicit and implicit (forms) of exclusion in contemporary democracies”. 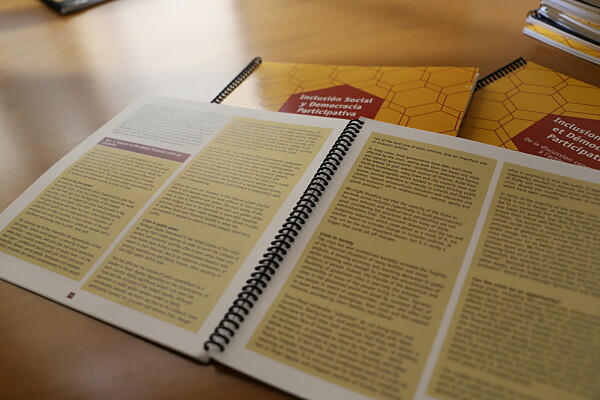 In order to promote a real culture of participation in exchange, the text assesses several models and visions of democracy, taking into account relevant concepts such as consensus, purpose, social engagement or the deliberative quality of participatory processes. In conclusion, an inventory of normative and operational instruments and principles is offered in regard to innovative local policies on social inclusion and participation. A city can thus pursue comprehensive, global goals such as to "develop and approve a local plan for social inclusion (...) with resources, a firm commitment at the level of participation and a clear system of indicators" as well as focus on egalitarian participation (how to eliminate the so-called "socio-demographic biases of participation") or even empowerment by focusing on the most excluded. As a corollary to these initiatives, the publication highlights the positive impacts of participation on the dimensions of social inclusion that justify specific local policies in areas such as active citizenship, access to work, non-discrimination, access to services and social protection, education and culture or strengthening social bonds among citizens. In line with the general approach of the document “Social Inclusion and Participatory Democracy: From conceptual discussion to local action”, the Committee has continued to articulate, gain experience and share local initiatives on these fields over time. Only in the last year, the Committee collected the experiences of cities such as Toronto, which promotes a comprehensive, social inclusion policy with the direct participation of the most excluded people; Grenoble, which carries out strategies to ensure the right to political participation of its foreign residents and promotes a new concept of urban citizenship; or even Montevideo, which promotes human rights-based housing strategies based on the participation and collaboration with city dwellers and organized civil society through housing cooperatives. Other publications promoted by the Committee, such as "Social Cohesion and Intercultural and Interreligious Dialogue", have brought together multiple local practices and the results of city-to-city exchanges showcasing how intercultural dialogue is actually key for strengthening social cohesion at the city level. On the other hand, the monitoring program of human rights on the basis of social inclusion policies implemented in the Bogotá Humana policy (final report here) stressed the suitability of linking community participation with social inclusion and human rights policies at the local level. On the basis of members’ initiatives, the Committee has equally articulated this debate in the field of the Right to the City and Human Rights: a framework where to defend a renewed social contract between local governments and citizens at the local level, and a space where to implement transformative, local policies of social inclusion and participation.